SUPERHYPERCUBE is a VR “first person puzzler” developed by my collective Kokoromi as a launch title for PlaystationVR. It features classic controls and intuitive shape-matching gameplay. 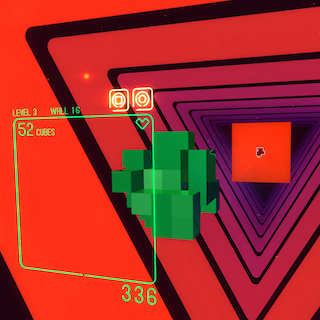 To play, you control a group of cubes, rotating it to fit through a hole in a series of floating walls that are constantly moving toward you. Each time you fit through another wall without crashing, more cubes are added to your cluster. 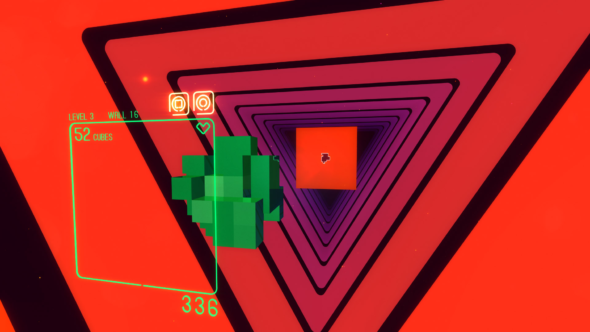 Head tracking is critical in the game – as your cluster of cubes gets bigger, you will need to lean around it to see the hole and quickly determine what rotations to make. Stay alive as long as possible, and add your high scores to the ranks of players around the world! We worked on SUPERHYPERCUBE in some form or another since its invention as a retro-3D game for our GAMMA 256 event, which took place in autumn 2008. The full-color VR version, which pulls equally from Virtual Reality nostalgia and the Light and Space art movement, was begun in late 2013 and published in autumn 2016.